In a new and unfamiliar land, the colonists carefully studied the Native American craft and began to create their own lifelike lures. The colonists came to call their new creations decoys. The word “decoy” derived from the mid-16th century Dutch word de kooi, meaning ‘the decoy’, and from the Middle Dutch word de kouw, meaning ‘the cage.’ These words described the practice of Old World hunters using tamed ducks to lead wild ones along a defined pathway into captivity. 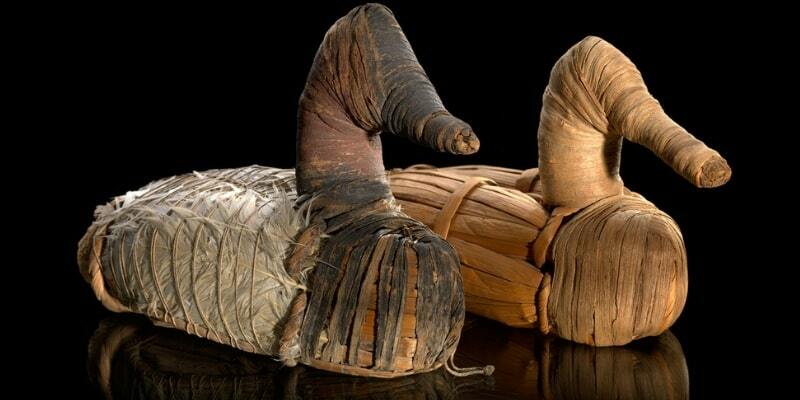 Duck decoys crafted by Native Americans, c. 400 BC-AD 100. 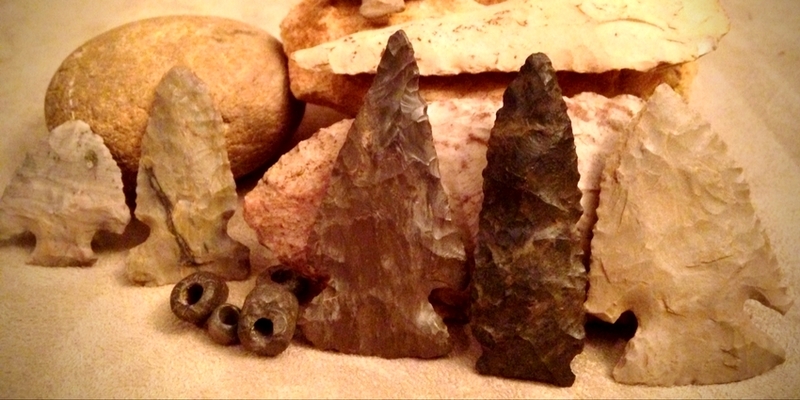 Found in Lovelock Cave, Humboldt County, Nevada. Crafted from Tule rush, feathers, cordage, and paint. Photo courtesy of the Smithsonian. By the early-to-mid-1800s, the art form had evolved from making decoys out of mud and grass, to making them out of wood. Although styles varied by carver and region, the types of wood used were fairly common. White cedar and white pine were favored by carvers, due to their buoyancy and toughness. To create a wooden decoy, a carver would first shape the decoy’s body using a hatchet and then knock down the rough spots with a drawknife. The head of the decoy would then be fashioned from a smaller block of wood. The carver would whittle the block of wood into the shape of a head using a pocketknife. From there, the head would be attached to the body using nails or similarly fashioned metal spikes. Once assembled, the carver would then sand and paint the decoy using the natural colors of the water fowl being mimicked. The design of a decoy was largely dictated by the species of water fowl in the carver’s region. Environment was also a factor. For example, the rougher the water, the more durable the decoy needed to be. 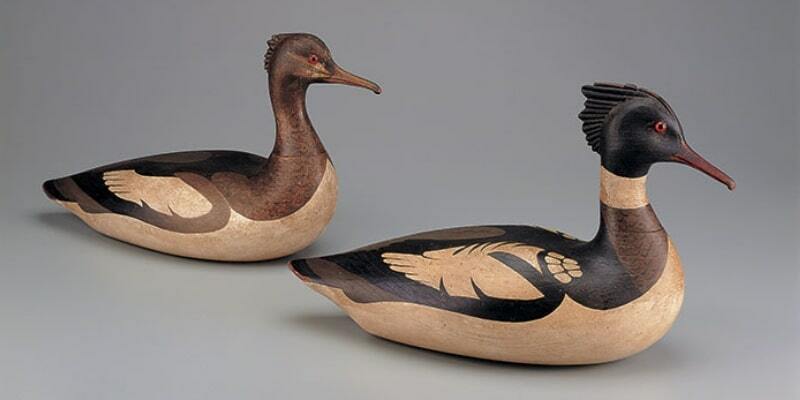 The Ward Brothers, Lemuel T. Ward (1897–1984) and Steven W. Ward (1895–1976), were two brothers from Crisfield, Maryland, who became famous for their wooden wildfowl carvings, commonly called decoys. Most decoys were built to float, and were intended to attract large water fowl like ducks and geese. While some were built out of solid wood, others were hollowed out so they would be more buoyant. Another prominent category of decoys was the “stickup”, which stood on a leg that was pushed into the ground. While commercial hunters deployed hundreds of common decoys at a time―where exacting details were not needed―a growing number of affluent sport hunters sought fewer, more artistically crafted decoys for their hunts. As the demand for these more exacting decoys grew, some carvers evolved their craft and began making decoys purely for artistic purposes. By the mid-20th century, the demand for wooden decoys had declined among hunters, but found new life among art collectors. This transition can largely be explained by two events. The first, was the passage of the Migratory Bird Treaty Act (MBTA) of 1918. The law prohibited the taking of migratory birds except under strict federal guidelines and also came with strict civil and criminal penalties. Migratory birds were viewed as a critical component in agricultural pest control, and it was becoming clear that restrictions on the hunting of waterfowl were needed to slow; if not reverse, the depletion of waterfowl populations. 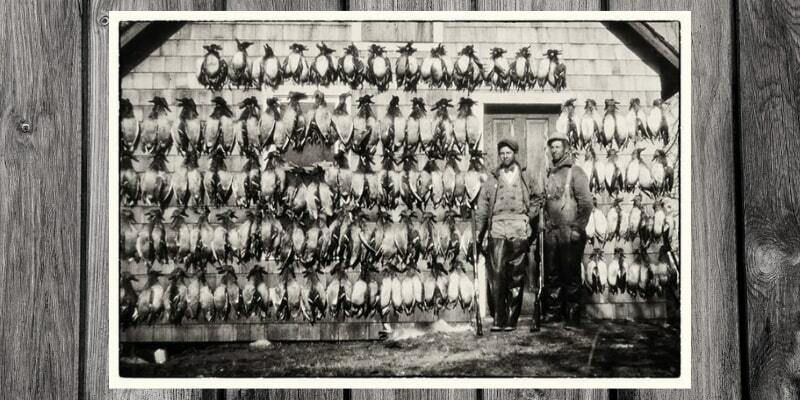 Shown in this photo are the results of a one day hunt by market hunters in the Chesapeake Bay during the late 1890s. Photo courtesy of Bakersfield.com. The law placed limits on sport hunting and banned commercial hunting of most water fowl species altogether. Subsequently, the demand for decoys nearly evaporated overnight. Wooden decoys became even rarer in the 1950s and 1960s when mass-produced plastic decoys were introduced to the sport hunting market. From a hunter’s perspective, plastic decoys had two distinct benefits over their wooden counterparts―they were cheaper and lighter. This drove wooden duck decoys into hiding. But they didn’t stay hidden for long. 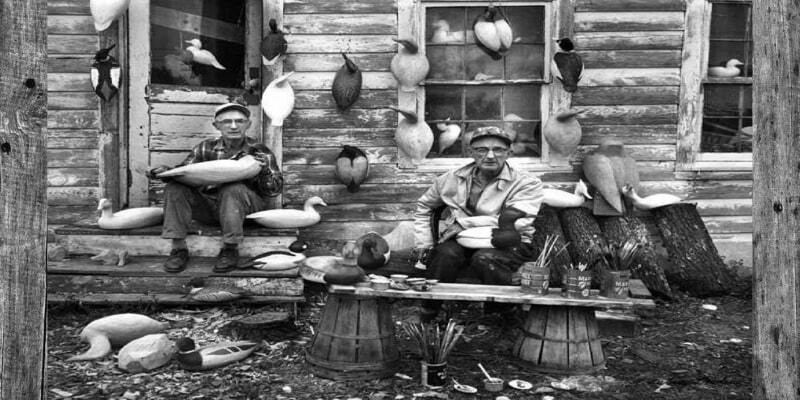 In 1963, author and devoted decoy collector Hal Sorenson, published a magazine titled the “Decoy Collector’s Guide.” Because of his magazine, antique collectors, and those that stumbled upon it, began to realize that there were people who collected decoys. Small pockets of decoy collectors began communicating, sharing information, and forming clubs. Before too long, decoy shows began springing up across the country. ﻿Red-Breasted Merganser Drake and Hen, carved by Lothrop T. Holmes (1824-1899). This pair is believed to have been carved in the time period of 1860-1870. Currently on display at the American Folk Art Museum, New York. The auction didn’t disappoint. One duck decoy sold for $10,000, which attracted more fanfare to the ever-growing collectible decoy market. Soon thereafter, interest, demand, and prices began to soar. Known as the decade of decadence, the 1980s brought us big hair rock bands, an explosion of drugs, Miami Vice, and extraordinary decoy auction prices! As the popularity of decoys grew, the genre drew the interest of more wealthy sport hunters and art collectors. 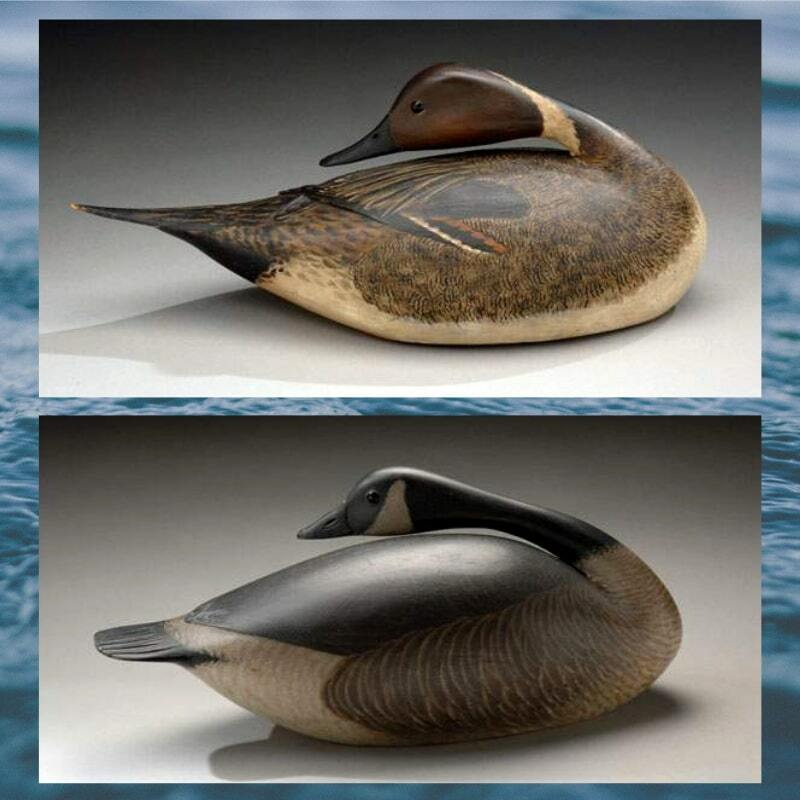 As a result, prices grew dramatically, with prized decoys selling for more than $300,000. Sought after decoys (crafted by celebrated carvers) continue to command high prices at auction, and seem to be rather recession proof. Prices have not been affected by declines in the antique market, nor were they negatively affected by the housing crash in 2007-2008. 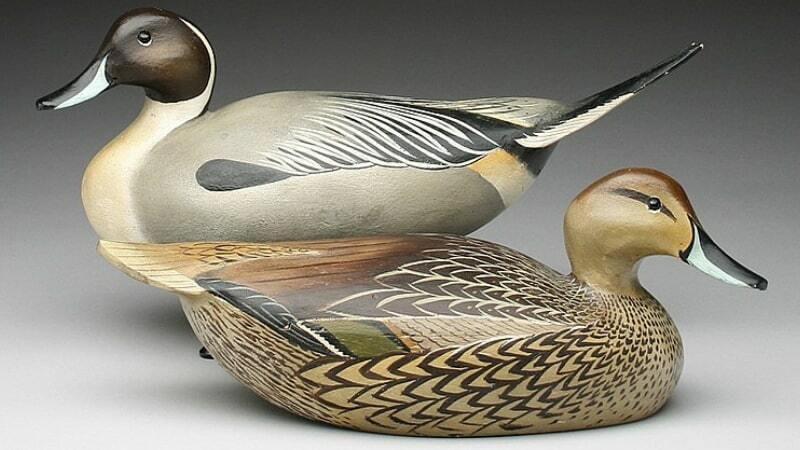 In September 2017, a pintail drake and a Canadian goose carved by the late artisan Elmer Crowell, sold for a record $1.13 million apiece, in a transaction that put the folk art world in a tizzy. The Crowell pair, carved between 1915 and 1917, were part of a larger $7.5 million sale of 31 decoys. Top: Elmer Crowell carved Pintail Drake. Bottom: Elmer Crowell carved Canadian goose. Both sold for $1.13 million in 2017. In fact, the auction house that facilitated the record setting sale, Guyette, Schmidt & Deeter―an auction house dedicated to decoys―has brought in more than $134 million in decoy sales since 1984. Fair market value for decoys is grounded in the same characteristics as other collectibles: availability of material in the market, the state of the economy, and demand. From there, value is driven by several factors unique to decoys. Rare hollow carved Canadian goose, Ken Anger (1905-1961), Dunnville, Ontario. 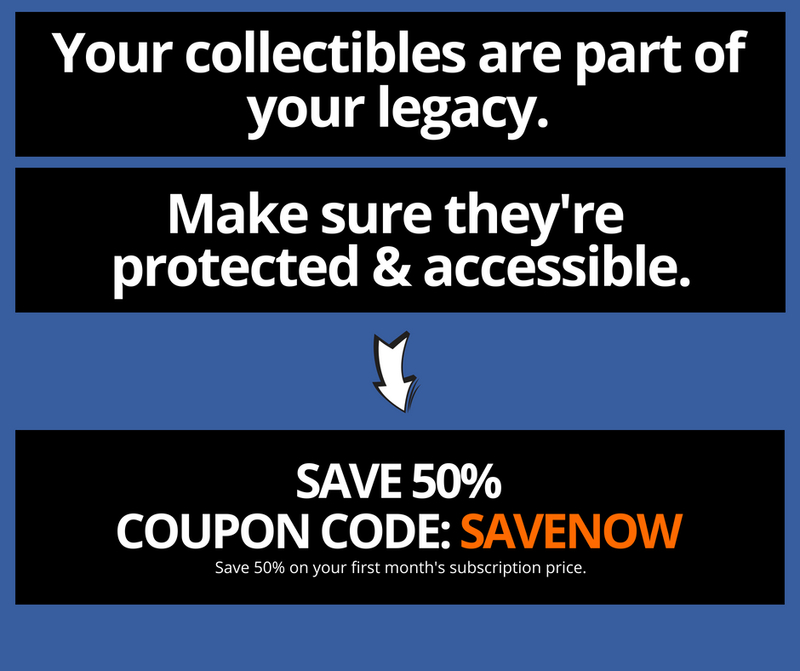 Carver: The reputation of the carver is one of the most important factors in determining value. Region: Where a decoy was made and used makes a difference in value. People from Maine want to buy decoys made in Maine. Species: Some species―like wood ducks―are rarer than others. Condition: Being that most decoys were used, many were repainted or repaired, which drives down value. 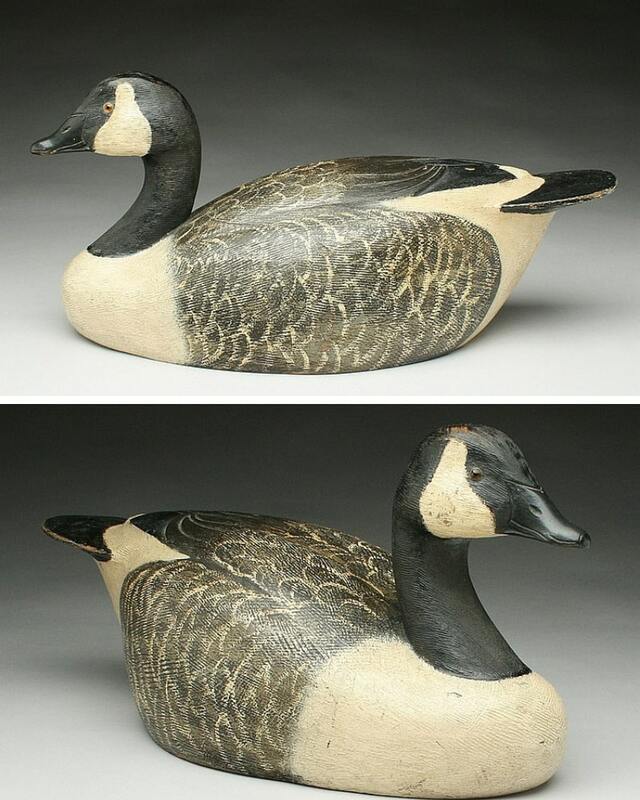 Conversely, decoys that are 100% original and in great shape, typically garner higher prices. 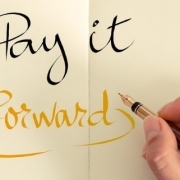 Scarcity: Unusual poses like feeding or sleeping are harder to come by. There are many carvers, both past and present, that could make the most popular list, but there’s a few names that rise above the rest. Arguably the most notable, was aforementioned Elmer Crowell (1862-1951), an outstanding carver and painter who operated out of Cape Cod, Massachusetts. Exceptional pair of 1948 model pintails, Ward Brothers, Crisfield, Maryland, circa 1948. Other notable carvers include Lathrop T. Holmes, “Gus” Wilson, Charles and Edna Perdew (he carved and she painted), Ken Anger, George Boyd, Albert Laing, Harry V. Shourds, John Blair Sr., Ward Brothers, Ira Hudson, Nathan Cobb Jr., Lee Dudley, Charles Schoenheider Sr., Robert Elliston, and Charles Bergman. While not the focus of this article, high-quality and highly collectible factory produced decoys are worth mentioning. The most notable among them were Mason, Victor, Dodge, Stevens, Peterson, Evans, and Reynolds. So, if it looks like a duck, but doesn’t quack like a duck, you might have yourself a one of a kind duck decoy!